Budgeting a person for full-time employment technically equals 10.5 months. Why? Verify the salary figure in NBAJOBS in Banner, or ask your fiscal technician for the most up-to-date hourly salary figure for all faculty and other personnel in your budget. Multiply this number by 173.33 (174) hours. This will give you salary per month. Multiply by the number of months in your budget. Multiply this figure by the appropriate leave benefit percentage (see current benefit rates here). This will give you the "loaded salary." Check with your fiscal technician to determine the job classification for each person listed on your budget. Take the "loaded salary" and multiply it by the appropriate staff benefits rate (see current benefit rates here). List the staff benefits figure on the "fringe benefits" line of your budget. Cost of living increases are based on the percentages found in Schedule 1 of our yearly benefit rate agreement proposals to ONR, plus some internal adjustments. These increases are updated every year in our internal spreadsheet template (Under Pre-Award Forms). Overtime is paid at 1.5 times the regular rate of pay, for hours worked over 40 hours per week. Sick leave, holiday leave or annual leave hours do not count as hours worked in a week in determining overtime. For example, if an employee uses 8 hours annual leave on Monday and works 40 hours Tuesday – Saturday, all time will be at the regular rate of pay. Leave and benefits do not accrue on overtime pay. Check with your Fiscal Officer/Business Office for student salary as it varies between each unit/department. A student working 20 hrs/wk for two semesters (E-class GN or SN) plus extra time on holidays may work a total of 760 hrs. A student working 40 hrs/wk all summer (E-class GT or ST) may work 560 hrs. FT summer work also accrues staff benefits of 8.6%. Total hours for a whole year: 1320 hours. Graduate student compensation will be gradually increasing to bring the stipend rates up to national norms, click here for current rates. You must request tuition for a graduate student researcher unless the sponsor will not pay tuition costs (include documentation w/proposal). If you wish to supply tuition from another source, include a memo confirming the source and available funds with the proposal. Since FY08, all proposal budgets including graduate students must also include health insurance for the graduate students. The UAF Graduate School has released the new graduate student health insurance rates for the 2015/2016 academic year (http://www.uaf.edu/gradsch/health-insurance/). Student health care fees should be listed as a separate budget line item under benefits, which is built in to our internal spreadsheet template. Student health care are subject to F&A (account code 1949) if they are provided to the student as part of a research or teaching assistantship. When these costs are included as part of a scholarship or fellowship, they DO NOT recover F&A and are excluded from the MTDC base (account code 6105). First determine what travel expenses the granting agency will allow (travel costs to meetings and field sites), and then itemize the cost of each trip. Break down by location, per diem, ground transportation costs, number of participants, and number of trips. If you don't know the exact location of a planned meeting, a placeholder city should be used for budgeting purposes. Per diem rates consist of a lodging component and a meals + incidentals expenses (M&IE) component. IMPORTANT: Do NOT use the per diem rates listed on the UAF Travel website for calculating per diem in budgets. Instead, use the methods listed above. Those rates are for internal per diem reimbursement purposes and not for budgeting in proposals. For per diem in Anchorage, Fairbanks, and Juneau only, use the daily lodging rate for the Alaskan city and add $60/day maximum for M&IE per UA Board of Regents policy. All other Alaska cities use the standard full federal per diem rates. More information is available in the UAF Travel Regulations. There are no University restrictions on traveling to a country with a current travel warning. However, travelers are encouraged to contact UA System Office of Risk Services if there is any potential danger involved during the travel. A sponsored project may include relationships with contractors, consultants and subreceipients. The pass-through entity holds the responsibility for deciding whether any given arrangement constsitutes a subaward (carrying out an intellectually significant portion of the sponsored award, creating a financial assistance agreement) or a contractor agreement (obtaining goods and services, creating a procurement relationship). Determining the appropriate relationship at proposal stage is critical to ensure appropriate accounting for costs and compliance requirements. Misclassification may result in delays in subaward processing, inaccurate calculation of costs (example, failure to include or exclude F&A costs), and time to request approval for project changes. In accordance with its agreement, uses the Federal funds to carry out a program for a public purpose specified in authorizing statute, as opposed to providing goods or services for the benefit of the pass-through entity. In determining whether an agreement between a pass-through entity and another non-Federal entity casts the latter as a subrecipient or a contractor, the substance of the relationship is more important than the form of the agreement. All of the characteristics listed above may not be present in all cases, and the pass-through entity must use judgment in classifying each agreement as a subaward or a procurement contract. For assistance in determining whether an entity should be considered a subaward or a contractor, please use this checklist. Subrecipients must complete and return a Subrecipient Commitment Form to UAF at the time of proposal. The exception to this is for FDP partner institutions (see below). Exception: UAF, as a member of the Federal Demonstration Partnership (FDP), has access to some streamlined business functions. As such, our intent is to streamline the process for Subrecipient Commitment Forms (SCFs). If a proposed subrecipient to UAF is an FDP partner institution, and if they have an entity profile listed at the FDP Expanded Clearinghouse, we will no longer require an SCF with the proposal. If another institution requests a Subrecipient Commitment Form from UAF, the FDP has developed suggested language to request the institution instead use UAF's FDP Expanded Clearinghouse record. If the institution does not comply with this request, please refer them to OGCA. Search for the FDP EC member institution and click on their institution name. This will download their institution profile as a PDF. Include this PDF in the shared drive with the proposal to OGCA, and no SCF will be required from the institution. Note that UAF is also listed on the FDP Expanded Clearinghouse. Determining the appropriate relationship at proposal stage is critical to ensure appropriate accounting for costs and compliance requirements. Misclassification may result in delays in processing, inaccurate calculation of costs (example, failure to include or exclude F&A costs), and time to request approval for project changes. Quotes for contractor-based services should be included with the proposal for review as backup. Some sponsors require quotes, so it is best practice to always secure and include a current quote. Materials and supplies are project-specific, expendable, and cost less than $5,000 per item. Budgets should clearly itemize supply lists when they are over $1,000. Be sure to differentiate between expendable supplies used in the lab/office and supplies used for fieldwork. Supplies should always be referred to as "project supplies" in the budget and justification. Since office supplies are not easily identifiable for a specific project and perceived for common use, they are normally an indirect cost and cannot be included. Equipment is defined as any item which will retain its usefulness beyond one year. UAF's threshold for equipment is $5,000 per piece of equipment/unit. F&A costs are not charged on equipment. Quotes for equipment should be included with the proposal for review as backup. Some sponsors require quotes, so it is best practice to always secure and include a current quote. Please see the policy/procedures on Fabricated Equipment. Participant support costs are costs to support individuals who are receiving a training opportunity as part of a workshop, conference, seminar, symposium or other short-term instructional or information sharing activity funded by a sponsored award. Costs may include stipends or subsistence allowances, travel allowances, and registration fees paid to or on behalf of participants (not employees). Also see #3 and #4 below. 2. What types of sponsored projects may include participant support costs? Projects with an educational or outreach component may include participant support costs. For example, a project may be in support of professional development and continuing education activities for secondary school teachers/educational professionals. Participant support costs for this project may include registration fees for the event, transportation to/from and lodging during the event, as well as a per diem allowance to cover meals and incidental expenses. 3. What costs can be included in participant support costs? Stipend: A stipend is a set amount of money to be paid by UAF directly to the participant. Subsistence Allowance: The cost of a participant’s housing and per diem expenses necessary for the individual to participate in the project are generally allowed, provided these costs are reasonable and limited to the days of attendance. Participants who live in the local area are not entitled to subsistence payments, although they may participate in meals and breaks provided at the meeting or conference. Travel: Travel includes the costs of transportation and associated travel-related expenses and must follow sponsor guidelines as well as UAF policies and guidelines. The sole purpose of the trip must be to participate in the project activity. Fees: The fees paid by or on behalf of a participant in connection with meetings, conferences, symposia, or training projects are generally allowable costs. Additionally, these fees may include laboratory fees, passport or visa fees for foreign participants, and registration fees. Other: Certain other costs in support of the participant’s involvement may be allowable, including training materials or laboratory supplies. Check the funding solicitation for guidance and contact OGCA with questions. 4. What costs cannot be included as participant support costs? Participant support costs should be considered as only those costs that can directly be attributable to an individual participant rather than costs that support all participants collectively. Costs for project organizers (such as PI, co-I, etc. ), speakers, and program facilitators or coordinators, even where these individuals may also participate as a program participant, are NOT considered participant support costs. 6. What are some examples of what might or might not be considered participant support costs? An NSF project has been awarded an REU supplement. The REU supplement will enable 5 undergraduate students from around the country to participate in a summer research project with a UAF PI. The students will be paid a stipend and provided room and board over an 8-week period. The stipends and room/board would be considered participant support costs. UAF is awarded a grant from a Federal agency to host an educational workshop in Washington, DC. Individuals (the audience is primarily postdoctoral fellows from around the country) will apply for financial support to attend the conference. The financial support will cover the costs to travel to and attend the workshop. Travel costs, as well as lodging/meals during the event, would be considered participant support costs. UAF receives an award from NSF that includes an REU component. The REU component allows the PI’s lab to support undergraduate student positions during the academic year over the course of the three-year grant. The students will be mentored and will assist with various research projects, e.g., media preparation, plant tissue culture, cloning, and mutant analysis. The student support would be considered participant support costs. 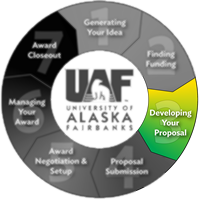 NSF provides an award to UAF that includes a Research Experiences for Teachers (RET) activity. The PI will host a teacher over the course of the summer who will gain research experience, and then use that knowledge to develop educational materials and activities. The teacher will pilot the activities with students and present the materials at regional conferences with fellow teachers. The teacher’s summer stipend, supplies for the activities, and travel to regional conferences would be considered participant support costs. UAF is part of a scientific collaboration involving PIs from five different institutions. The UAF PI hosts a meeting with her Co-PIs and other scientists to discuss project progress. Collaborators must travel to Fairbanks to attend the meeting. The costs for this meeting of scientific collaborators to discuss the project would not be considered participant support costs. As part of a conference grant, a UAF PI invites an expert in the field to talk about her recent discoveries that were featured in a prominent scientific journal. In order to support the expert’s attendance, the grant provides an honorarium of $2,000. The honorarium for the speaker would not be considered a participant support cost. 7. When are participant support costs allowed? Participant support costs are allowable with prior sponsor approval, per Uniform Guidance. In addition, individual agencies may have specific policies restricting the use and allowability of participant support costs. NSF has historically allowed participant support costs, for instance, in the REU and RET programs. NIH only allows participant support costs if they are explicitly identified in the Funding Opportunity Announcement. Other Federal and non-Federal sponsors may allow participant support costs under some circumstances. Review the funding solicitation for specific instructions and contact OGCA with any questions prior to proposal submission. 8. Should participant support costs be identified in the budget/budget justification? Yes, participant support costs must be explicitly identified in the budget and budget justification. For instance, the NSF budget form has a section specifically for participant support costs. If the budget form you are using does not have such a section, but you plan to include participant support costs, please explicitly identify any participant support costs in the internal UAF budget spreadsheet and budget justification. Participant support costs are excluded from the MTDC base when calculating F&A costs. Identifying participant support costs will help ensure prior sponsor approval is requested and, if awarded, that OGCA sets up accounting with the appropriate F&A. 9. Can I rebudget participant support costs into another budget category after an award has been received? Maybe. Generally, it is not allowable to rebudget from the participant support costs category into other budget categories unless prior written approval has been obtained from the sponsor. If approval is obtained from the sponsor and funds are moved from participant support costs into other budget categories, F&A costs will be applied to the rebudgeted funds as appropriate. 10. If participant support costs were not included in the original award, can I add a participant support component to my project? Maybe. Adding a participant support component to the project will need prior approval from the sponsor. With the sponsor’s approval, one option to fund this new component would be to rebudget unused funds into participant support costs. OGCA can assist with submitting a prior approval request to rebudget funds for this purpose. The other option would be for the PI to request a supplement for participant support costs. A supplemental proposal would need to be submitted. If approval were obtained for participant support costs, OGCA would set up the proper mechanism under the award in order to separately account for these costs and apply a 0% F&A rate as required by the Uniform Guidance. 11. What kind of documentation should a department keep on file for participant support costs? Similar to other award-related expenses, a department must maintain back-up documentation for all participant support costs. This would include a list of program participants and evidence of attendance of participants, such as a daily log or similar documentation. 12. Are participant support costs treated differently in the Uniform Guidance than they were in OMB Circular A-21? Yes. Previously, in A-21, the definition of MTDC did not address participant support costs. In the Uniform Guidance, the definition of Modified Total Direct Costs addresses participant support costs. This means, for awards from any agency that are made under the Uniform Guidance, participant support costs (similar to equipment) should be excluded from the base used to calculate F&A costs. 13. Are payments to research subjects/participants considered participant support costs? No. A payment to an individual who agrees to participate as a human subject in a research project is not a participant support cost and should be budgeted as Other Direct Costs in the project proposal and internally under account code 3031. 14. Are costs to support pre- or post-doc trainees in a training grant considered to be participant support costs? The answer depends on the sponsor. Generally, costs for training grant programs are not considered participant support costs. Training grant programs are not typically short-term experiences and are not consistent with the types of experiences considered to be participant support activities. Trainees are also actively engaged in the scope of work, where participants do not perform work or service for the project or program. 15. What if a sponsoring agency representative requests that I move student hourly employee costs to the participant support costs budget section? It depends. If UAF has determined that student hourly employee is the appropriate role, then a compelling justification should be sent to the sponsoring agency representative about why that determination was made. Guidance from the National Science Foundation is that the institution determines whether a student hourly employee or participant is appropriate for the project. However, for the NSF REU program, any student involved would be considered a participant. The NSF REU program is intended to provide a practical educational experience for undergraduate students, to develop their research skills while being mentored. Given the goals of the NSF REU program, it is not possible to have both student hourly employees and participants – all students on an NSF REU project should be considered participants. Per Graduate School standing policy, tuition must be included for a graduate student research assistantship unless the sponsor will not pay tuition costs (include documentation with the proposal). If you wish to supply tuition from another source, include a memo confirming the source and available funds with the proposal. Please note that students must be in the state for 2 years to qualify for the in-state tuition rate, or they can apply for resident status after residing in the state for one year under the university's "bona fide resident" provision. Students having non-immigrant visa status are not eligible for Alaska residency. For budget planning on proposals, OGCA recommends 2 years of out-of-state tuition. Full time graduate students are enrolled in 9 credits each semester (18 credits for academic year). For current tuition and fee rates, please visit the UAF Financial Aid Office page. Fellowships and scholarships are exempt from F&A recovery.